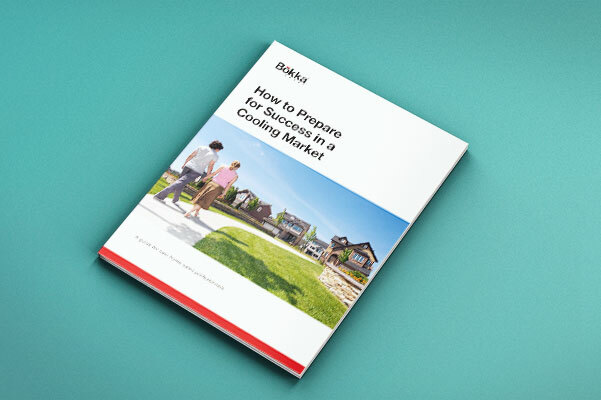 In Parts 1 and 2 of this series, we covered the impact of a dedicated customer experience (CX) initiative to home building performance and the components of a winning customer experience strategy. In Part 3, we’ll look at measuring the customer experience as part of your CX program. According to Gartner’s 2017 Customer Experience in Marketing Survey, 76% of B2C CMOs expect to compete mostly or completely on the basis of CX within the next two years, yet, only 2% have a strong CX metrics program. We know that measuring and taking action on the correct metrics can be the difference between a successful CX initiative and an unsuccessful one. So let’s discuss how to go about choosing which metrics to measure. There isn’t a universal metric that’s right for every company. Or even every CX initiative. In fact, according to Gartner, “most large organizations with revenue of more than $1 billion have more than 50 CX metrics...all owned and managed by different people in different parts of the organization.” We find this to be especially true for home builders. What’s important is finding the correct metric(s) for your initiative. One that provides the most value and actionable insight for your organization. There are several notable methodologies* to help us select the right metrics. We’re familiar with all of them, and overall we find Forrester’s approach most relevant to home building organizations. Is the metric a leading indicator for financial success? Does the metric energize (and enable) your employees to improve CX? Does the metric-related survey question make your customers feel good or valued? At Bokka, we take a similar approach to measuring the experience — starting with simple metrics to achieve some baseline scores and develop processes around taking feedback-based action. Tying this feedback to a key business metric will help determine the success of the overall initiative. The beauty of this approach lies in its simplicity. Everyone in the organization can easily understand how the experience is being measured. This is the basic component that every builder needs to get right to survive. It’s the product itself: the home (and the community in which it resides). Nearly every builder already measures how well they deliver a quality home at a reasonable price. It comes in the form of product surveys that assess how happy customers are with the house itself. The most common metric used is a Customer Satisfaction Score, which asks “How satisfied are you on a scale of 1-10 with your home’s _____?” (windows, doors, cabinets, etc.). 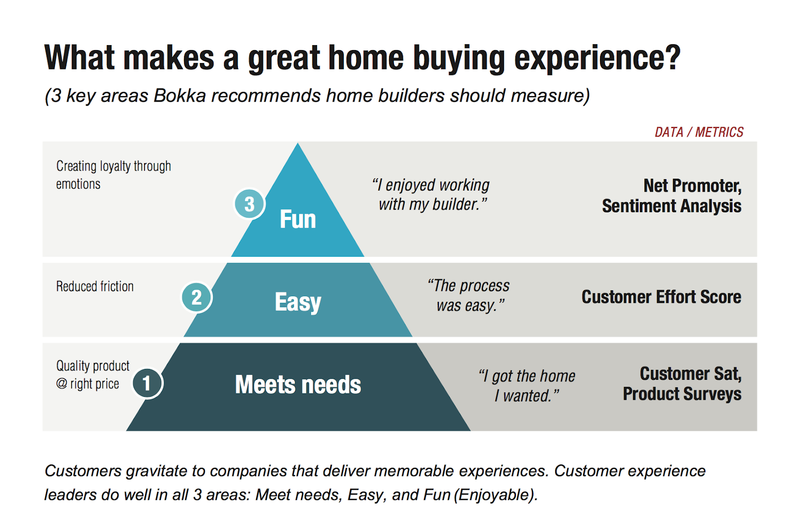 These are great metrics for giving customers the home they expect. Unfortunately, it’s where meaningful measurement of the CX ends for most builders. This is the second level of the pyramid builders use to find out how easy is it to do business with you. Buying and building a new home involves more moving parts & processes than just about any other consumer purchase. And the customer needs to be involved, personalizing their home along the way. Therefore we need to measure and reduce friction at every touchpoint, through the use of a Customer Effort Score (developed by HBR in 2010). This is a straightforward metric based on a five-point scale of "Very Difficult" to "Very Easy," where the customer is asked how much effort was required during an interaction. We can get Meets needs and Easy right and still fail to create a customer experience that’s memorable. The top level of the measurement pyramid is about the customer’s emotion and is more difficult to accurately measure. But it’s one of the most important things nonetheless. Think of any company you’re loyal of for its customer experience, and you will be able to recall something they did to make an emotional connection with you. For builders, it could be something an employee does to go above and beyond, like leaving a framed photo or gift in the new home as a surprise. These memorable moments get shared in the form of referrals and reviews and are the most powerful and long-lasting. The best metrics for measuring these are Net Promoter Scores (NPS) and open-ended comments analyzed from surveys and review sites, also known as Sentiment Analysis. Measuring each phase of the building process allows us to create an emotional profile (show sample profile inset) that shows peaks and valleys of the overall experience that may need to be addressed in order to turn a mediocre experience into an unforgettable experience. Focusing heavily on CX metrics doesn’t mean we abandon other critical KPIs. In fact, some traditional KPIs have a powerful influence in the CX world. Take Customer Lifetime Value for example. Understanding which segment of your buyers is expected to deliver the highest CLV helps prioritize which CX initiatives should receive the most attention. To see the biggest impact on your bottom line, address your most valuable customers first. Another example of a non-customer metric that strongly influences the customer experience is Employee Engagement. (At Bokka, we actually consider Employee Engagement a key CX metric as part of a strong Voice of the Employee program.) People want to do good. Happy and engaged employees will provide better service when they know they’re working toward a larger mission to provide a great experience. This approach can also be applied to the trades. The majority of the home building experience comes during construction and warranty. Show your trade partners their role in the customer experience and encourage them to raise the bar. Incentivize partners based on the level of experience they’re providing and how well they’re representing your brand values. Ask for their feedback often, and act on it. Doing the right thing for others is contagious. When you provide a great experience for your trades, they’ll in turn provide a great experience for your customers. As mentioned before, start small. Select a single metric such as NPS and measure it at each phase of the building cycle (not just the standard Post-Contract, 30-Days Post-Close, and 10-Months Post-Close). Tie these results to a business metric that’s meaningful to your organization like profitability, market share, or customer lifetime value. Then set a benchmark and goal for improvement. As soon as you start collecting user feedback, be ready to act on it. Look for obvious ways to make it easier and more enjoyable for customers to interact with you and resolve their unmet needs. For example, give access to a real person when something goes wrong with their home. Don’t make them go through a cumbersome process to “submit a warranty claim.” This customer experience is too similar to that provided by insurance companies, where SOP is to pay as few claims as possible. With so many survey collection tools available, it’s getting increasingly difficult to get customers to give us their valuable feedback. Think about it — how many times have you started to complete a company’s survey, then opted out, thinking they don’t really care about your problems. It may seem obvious, but we should routinely follow up with customers that give us feedback. Every customer who provides feedback wants two things: 1) to feel their voice is being heard and 2) to know it’s actually making a difference. Following up not only encourages customers to continue giving feedback, but it’s the first step toward making their experience better: acknowledging what they’re going through. It’s simple, but very powerful. Remember, the customers most willing to give you feedback are also the ones most likely to write reviews about you. Identify them early and cultivate the relationship to the end. To review, we’ve looked at the role a CX metric program plays in your overall CX initiatives. We’ve also discussed some common approaches to choosing metrics, as well as some specific metrics we use for measuring the customer experience. If you are unsure why CX matters to home buyers, or if it’s worth your investment, check out Part 1 of this series. You can also review Part 2 to see common components of a holistic CX program. In Part 4 of this series, we’ll reveal the Home Building CX Canvas - our tool for mapping a single-page visual roadmap to an improved buying experience. So stay tuned. For more immediate results, let’s talk. We geek out on this stuff. We’d love to discuss your business problems and create a customized CX strategy for your organization. Similarly to Forrester, Temkin Group offers a 5-Step Process for a Strong CX Metrics Program that consists of: Determining a Core CX Metric, Setting Achievable Goals, Identifying Key Drivers, Establishing Key Driver Metrics, and Making the Metrics Actionable.